TDS or Total Dissolved Solids is a value used to evaluate the water quality. TDS is the total of all inorganic and organic substances dissolved in a solvent. In our case the solvent is water and can it be drinking water or wastewater. The unit of measurement for TDS is expressed in micrograms per liter or in PPM, parts per million. In drinking water above all calcium, but also total dissolved magnesium, nitrates and chlorides, are the most found chemicals in the water influencing the TDS. These elements are all found also in seawater, and of course on top a lot of sodium. Just to get an idea, in the US a tap water with 500 TDS, is considered as a good water. Hard water start at 1000 ppM and seawater have a TDS level of 40,000 and more. TDS meter, as seen on the left, are used to meassure the total dissolved solids. TDS meters measure the conductivity of the liquid and can thus draw conclusions about the TDS in the liquid. The total dissolved solids tell nothing about the water quality, this value is just one parameter for calculating how water might react in technical environment. Calcium and magnesium have the tendency to precipitate and form scale in pipes and in machines. An absolute figure, from which amount of TDS the scaling starts, can not be given. The pH of the liquid is influencing this a lot as well. At a pH <7, which is seen as acidic, there is a higher tendency of dissolving carbonates, at a pH >7 liquid is seen as basic, the percipitation is increasing. In easier words scaling is happening more likely at a pH of 7 or higher. 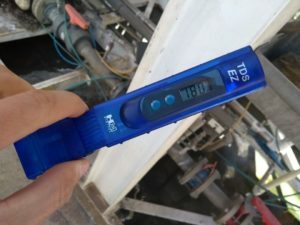 Practically TDS is used for instance to check the quality of cooling water. There are limits set by the user of cooling water systems. If the TDS reaches a certain value, blow down has to be done. Users try to keep the TDS as low as possible, in order to avoid any kind of scaling or fouling in their system. Another very practical use is to see how efficient a filtering system is working. By definition the particle size has to be less then 2 micrometer. If one like to see the perfomance of a reverse osmosis system or an ultrafiltration system, one can compared the TDS before and after the unit. This way one can see if the filter is still performing well.